During the past school year, hundreds of high school journalists throughout the country worked hours to complete their portfolios for state Journalist of the Year contests, and the 31 state winners who entered the national competition were recognized April 19 at the closing awards ceremony of the JEA/NSPA Spring National High School Journalism Convention in Denver. 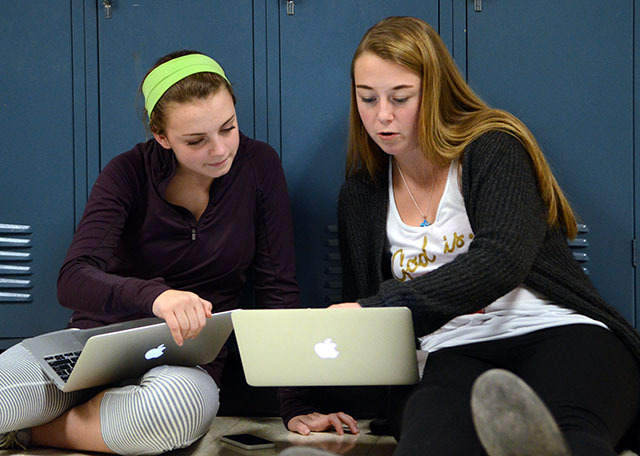 Julia Poe, right, of Shawnee Mission East High School in Prairie Village, Kansas, was named the 2015 National High School Journalist of the Year. When the final results were announced, Julia Poe of Shawnee Mission East High School in Prairie Village, Kansas, was named the 2015 National High School Journalist of the Year. Poe will receive a $3,000 Sister Rita Jeanne Abicht Scholarship as part of her recognition from the Journalism Education Association. Her journalism adviser is Dow Tate. Andrea Johnson, Southside High School, Fort Smith, Arkansas (Susan Colyer, MJE, adviser). Jackson Brook, Palo Alto (California) High School, (Paul Kandell, adviser). Gabe Rodriguez, Mountain Vista High School, Highlands Ranch, Colorado (Mark Newton, MJE, adviser). Mia Karr, Harrisonburg (Virginia) High School (Valerie Kibler, CJE, adviser). Nicholas Fiorillo, Mountlake Terrace (Washington) High School (Vincent DeMiero, adviser). Named in honor of JEA’s longtime treasurer, the late Sister Rita Jeanne Abicht, the scholarships recognize some of the top high school journalists in the country. Portfolios are judged in the month leading up to the JEA/NSPA spring national convention, and scholarship funds are paid directly to the recipients in honor of their work on scholastic media. The national applications this year were all submitted digitally for the first time. The competition attracted dozens of entries in some states and none in others. The 21 members of the scholarship committee were impressed with the depth of experience contained in the state-winning entries. Candidates took the updates of the contest and used technology to their advantage by developing online portfolios. Journalism has led Poe through her high school career. She is a four-year member of The Harbinger online staff, where she has been editor-in-chief her junior and senior years. Reluctant as a freshman, Poe found confidence in her storytelling abilities. Always trying to uncover the unique stories that she felt her community needed to know, she connected with those around her. Although writing is her forté, she worked to expand her skills, and learned more about photography, video and broadcast. Her desire to know more about sports broadcast led her to commentating during football games and conducting sideline interviews, which gained the respect of the players. Andrea Johnson of Arkansas is described by her adviser, Susan Colyer, MJE, as a convergent journalist who possesses the ability to write, film and photograph using whatever technology is available. “Clearly, the candidate has a passion for journalism that will lead her to collect many more press passes throughout her years in college and beyond,” said judge Lizabeth Walsh, MJE, and adviser at Reno (Nevada) High School. Jackson Brook of California was a standout to the judges because of his maturity and professionalism with controversial topics. Gabe Rodriguez of Colorado leads a convergent program, with experience in all media. Daniel Bodden of Missouri is also a 21st century journalist, as he leads and works with multiple media to tell stories. Mia Karr of Virginia details for the judges in her self-analytical essay how she will find a way to get to the school when classes are canceled because of bad weather. It is that important to her to make a deadline. “Karr truly gets it when it comes to being an editor-in-chief — I would love to have her on my staff, and I would have loved to have written for Karr as a staff writer,” said judge Mitch Ziegler, CJE, and adviser at Redondo Union High School, Redondo Beach, California. Nicholas Fiorillo of Washington led the charge to update his school’s traditional newspaper to a newsmagazine format. He also implemented the use of 21st century reporting tools of social media and live streaming. WASHINGTON: Nicholas Fiorillo, Mountlake Terrace High School, Mountlake Terrace (Vincent DeMiero, adviser).